Hidden in a corner of Paragon, ADEVA Spa is a welcome respite from the hustle and bustle of the city. My partner and I decided to check this place out right after our vacation — we literally brought our luggages after touching down in Singapore. The place was so serene with minimalistic yet functional furniture. I also saw celebrity blogger @Jemmawei with her boyfriend trying out their services— she looks really gorgeous in real life! Read till the end to find out how you can enjoy an online exclusive for couple spa (worth $727.60). Unfortunately, the counter staff was very busy with their admin work that it took awhile before they noticed our presence (we were right in front of them at the counter)! We were given some profiling sheets to fill in. Unlike other spa places I've visited, the form from Adeva had a section which specified our preferred area of focus. I chose my shoulder blades and neck while my partner chose the lower back. We were given a cup of warm water each before being shown to our room. We had the 90-min Triplex massage ($288.90 per pax), which combines three massage techniques from Aromatic, Shiatsu and Swedish. While the masseur was pretty skilful in her craft, I wasn't as comfortable with her demeanour. Halfway during the massage she asked if I usually sleep very late. I asked her how would she know, but she said something in quite a demeaning tone in mandarin. I have to credit her for her skills though — it was definitely extremely relaxing and I fell into a DEEP sleep! After the massage, we were served detoxifying ginger tea and delicious red bean soup. What a refreshing way to end the massage session! Red beans contain all three of the minerals that are key to controlling blood pressure -- calcium, magnesium and potassium. In addition to benefiting your heart, red beans also help you avoid muscle cramps and prevent cancer! For the full price list, visit ADEVA's website. 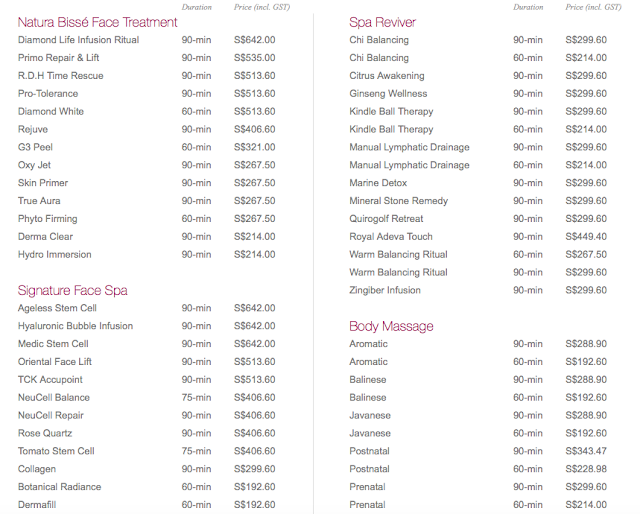 There is also a membership program for anyone who purchase any of ADEVA spa packages. Apart from receiving special promotions, you will also be served healthy sandwiches after each session. 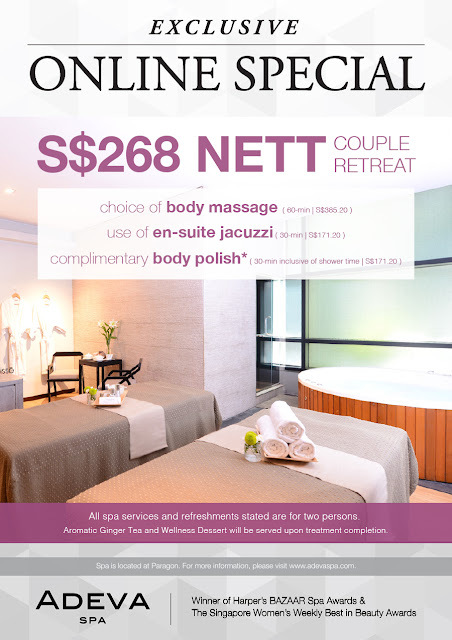 [EXCLUSIVE Online Special] Enjoy a couple's retreat at $268 NETT for your choice of body massage + use of en-suite jacuzzi and complimentary body polish!